Finally, there are fishing tours and charters in the Galapagos Islands and we are the only company with a permit to do so, after extreme consideration by the Galapagos authorities together with the AIM which is the entity that regulates all activities related to fishing and tourism in the Galapagos, fishing tours are now allowed under world-class environmental controls and regulations; one of them being that sport-fishing trips can only be guided by local, active fishermen in order to stop out of season fishing and the illegal capture of species such as sharks, and seacucumbers among others. The Galapagos Islands Sport-Fishing Company has its roots in the current owner’s grandfather’s arrival to the islands in the 1940s, when the only activity, and therefore means of survival in Galapagos was fishing. We are the only local company run by "Galapagueños" giving work to locals and promoting conservation of marine species, while at the same time contributing to the local economy and education. 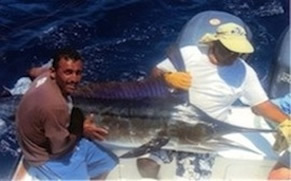 Please let us know how we can best prepare your unique fishing tour in the Galapagos Islands. Day 1: Very early in the morning one of our mainland guides will pick you up at your hotel and take you to the airport to catch your flight to Galapagos. Day 2: Aproximately at 6am we will be on our way to the eastern side of the Galapagos which is known as one of the best fishing areas. Day 3: Early morning departure to the southern side of the Galapagos for another fishing day, besides looking for bill-fish, you can also expect to catch Tuna, Wahoo and Jacks. Afternoon return to town and back to the hotel. The marine currents basically set the pattern for the Galapagos Islands weather. The "garua" season, June to December, is influenced by southern currents coming along the west coast of South America.